Karditsa is also the old name of Akraifnio in Boeotia. 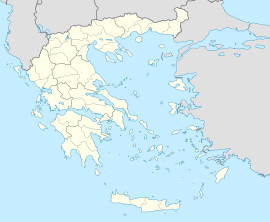 Karditsa (Greek: Καρδίτσα, Greek pronunciation: [karˈðit͡sa]) is a city in western Thessaly in mainland Greece. The city of Karditsa is the capital of Karditsa regional unit. Karditsa has elementary schools, high schools, junior high schools, the Veterinary Medicine Department of the University of Thessaly, three technical education departments, churchs, banks, a post office, a railway station, a sports ground, a water tower, and squares. Karditsa is one of the most bicycle-friendly cities in Greece with an extensive network of bicycle paths. Approximately 30% of all the city transportation, according to the National Technical University of Athens, is done by bicycles. During the period of Ottoman rule in Thessaly, the main settlement in the location of modern Karditsa was called Sotira. In 1810, the English traveler William Martin Leake mentioned a sprawling village named Kardhítza, consisting of between 500-600 houses, of which the majority of the inhabitants were Turkish. Karditsa was incorporated as a new city in 1882, the year after its liberation from the Ottoman Empire. During World War II, the resistance in Thessaly was fought primarily by the ELAS. In March 12, 1943 Karditsa was liberated temporarily by ELAS after the Italian capitulation. The municipality has an area of 647.3878 km2, the municipal unit 110.086 km2. Karditsa is served by trains on the Palaiofarsalos-Kalambaka line, with connections to both Athens and Thessaloniki. Karditsa has many clubs in various sport. The most of them are active in football such as Anagennisi Karditsa, AO Karditsa, Asteras Karditsa and Elpides Karditsas. The club SPA Karditsa is active in volleyball. ^ Arrowsmith, John. "Turkey in Europe, 1832". ^ Leake, William Martin. Travels in Northern Greece. (1835).